Below is the toddler version I developed after my little one started walking. 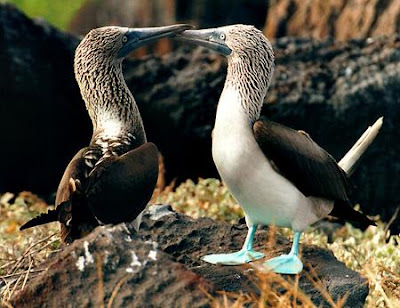 These were inspired by the blue-footed booby. Photo courtesty of Chris Abraham. The booby socks use the same pattern as the Duck Socks except they have a flat sole. Please stay tuned for a followup blog post with more detail, including the booby sock pattern. I'll be back soon! 1. Want an adult version? I'm working on it! Stay tuned to the blog and I'll post both additional sizes when they're ready. 2. DPN-users, check out this video, posted by Mojen on Ravelry: http://www.flickr.com/photos/mojen/4457054527/. Thank you Mojen!